Old warhorses they may be, but there is always something new to say about the Go-Betweens. In that respect they are like death, and love, and birth. Marriage, even. 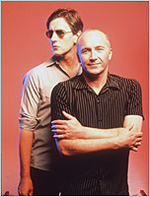 When I heard at the end of the ’90s that Grant McLennan and Robert Forster were renewing the vows of their musical bond, I thought that they should stick to writing and recording as an acoustic duo, as that seemed a more graceful way of being a forty-something Go-Between than playing the abrasive rock’n’roll of their youth. An opinion confirmed on seeing them perform without a band in 1999, but modified on hearing The Friends of Rachel Worth, though their comeback long player probably worked best when the pace slowed and the instrumentation was at its most sparse. And having now seen them play two sets at the Barbican, I realise they were right to draft in youthful bass and drums. They play a first set as a three piece with as much friction and attack as when Lindy Morrison sat on the drum stool; after the interval, the developed sophistication of their songs as a four piece is apparent, though the tough planes and sharp edges are retained. Even with the addition of softening strings, there is a hard metallic sheen about the music from the Liberty Belle and Tallulah period. (I’ve always thought the title of an early American compilation perfectly apt: Metal and shells.) They manage to be both the group they are today, and true to the groups they were at the various stages of their history. So the Go-Betweens can do what they want. Why should they go gentle and acoustic into that good night; why shouldn’t they rage electrically against the dying of the light? Tall and willowy, there is no-one else like Robert Forster. Within his character are film star shades and comic turns - leading men, for sure, like Robert Redford, but I also think I spot John Cleese threatening to break into a silly walk, while R sees roguish and knowing Bill Nighy. He carries himself like the actor he trained to be; he might have had to have fought hard to avoid being typecast in camp roles. R says he’s the only musician she knows who wears his guitar like a handbag. It’s a compliment (I think) which reminds me of his hair care tips for Debris magazine in the ’80s. This is a man who knows that substance outlasts style, but nevertheless can’t help checking his coiffure and threads in a full-length mirror before stepping out. There may be someone else like Grant McLennan - balding Australians in white and orange t-shirts are ten-a-penny - but no-one writes songs like he does. ‘Too much of one thing’ or, as Robert introduces it, ‘The ballad of the Go-Betweens’ is entrancing, maintaining its skiffle groove as he and Grant trade verses. The songs from the two post-reunification albums, Rachel Worth and Bright yellow bright orange, sound of a piece with the rest, as if the period of separation was much shorter than it was. The consistency of their song-writing as a pair is staggering. Every song has something about it that lifts it far above the ordinary: a sun-dappled pop melody, a lyric you might like for your grave stone or your screensaver, a guitar figure which illustrates exactly what music means to you, time shifts which make you want to take up drumming, a chorus that fills your heart, instrumental shading that fills your eyes. Frequently their songs have all of these, and more. On ‘Spirit’ Robert sings, ‘Your one thing greater than all the things that you are together.’ He’s talking about the woman he loves, but he could easily be summing up his own band. Song follows song. There is a lusty version of Robert’s solo single ‘Baby stones’ which bounces like a well-skimmed pebble, propelled by the pleading lyric and Adele Pickvance’s bass rumble. At the end of a majestic ‘Cattle and cane’, in which the freshening of one’s memory of a song about memory by a group whose music has been a part of half your life gives rise to layer upon layer of evocation, Grant applauds his drummer Glenn Thompson. It is half-way through the second set before the much-anticipated string section appears. Three are introduced as having bowed on Liberty Belle, so it seems strange that of the songs Audrey Riley arranged for the Go-Betweens’ most perfectly conceived record, they only play ‘The wrong road’. While I wonder whether this was a missed opportunity to play Liberty Belle in its entirety Brian Wilson-style - with more orchestral swoop and swish - the group and the quartet launch into a rich and forbidding version of ‘The house that Jack Kerouac built’, the staccato bowing and playing summoning a mood which is Bohemian in the best of both its senses. Maybe after we left, they carried on playing all night, and eventually got round to ‘Palm Sunday’ and ‘In the core of a flame’. Like I say, the Go-Betweens can do what they want. We leave the Barbican with the strains of Robert singing ‘When people are dead’ leaking from the foyer speakers. The walkways of the Barbican are deserted, the concrete complex still, but alive with lamplight. The sky above its rectangles of water and after the earlier rain is a clear, darkening blue. It’s the feeling you get on leaving a cinema to find an echo of the colours of the film - one in which Robert Forster has starred opposite, say, Nicole Kidman - in the sodium and neon light outside. We follow the old yellow guide line through this early attempt at an amalgam of culture and living space, an idea which - like the Go-Betweens - has always seemed just outside of its time, and none the worse for that.